timer – you using yours? Earlier today I had no less than 4 timers going at the same time for different things. Man alive I love my timers. What does that even mean – man alive? Hmmm. Food for thought. Maybe I’ll google that later. But right now I’m busy. Writing about my timers. You see, one of my timers I labeled “at the computer” and once it goes off, I’ve got to get up and set my other timer called “get up and do”. So my time with you is limited today. This timer is an app on my phone called Chronolite. My other 3 timers I have going are: Jenn’s medicine, Ashlyn bathroom, and laundry. They’re all on my phone. Love that because I always have my phone with me. I have lots to do at the computer. Most of it is business. Like paying bills, writing in my journal, checking email, replying and composing emails, looking at my kids’ grades, writing this blog post, etc. Some of it is fun stuff. Like Pinterest, Facebook, scrapbooking, etc. If I didn’t set my timer, I could literally spend the entire day on the computer. My eyes would start hurting, my hands would start hurting, my legs would stiffen up and my bum would start going numb. Not to mention my kids would be neglected and the house would go to pot. Not pleasant, I tell ya. So I give myself a short period of time to do some stuff on the computer. It helps me stay focused at the task at hand because I know my time is limited. Like I mentioned above, if I didn’t set my timer I could easily spend all day on the computer. 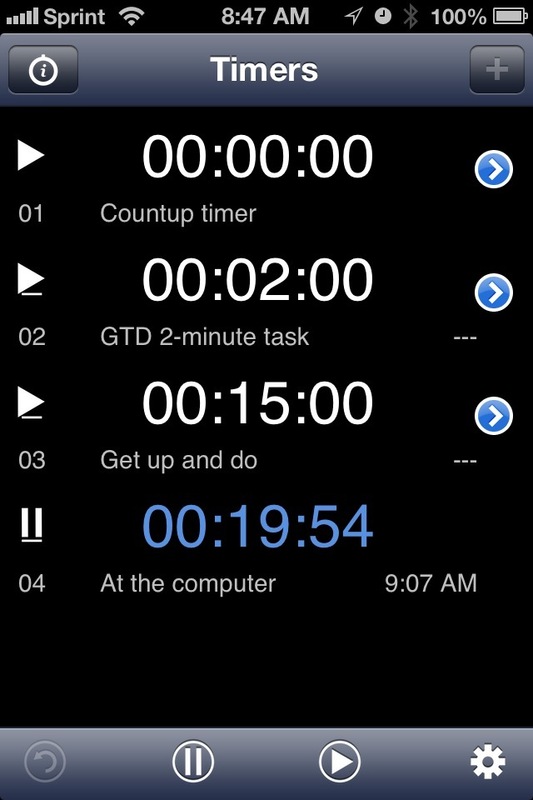 My Get Up and Do timer gets me off the computer and doing something around my house – mostly cleaning. It keeps my house from falling apart. It also keeps my blood flowing and my bum from going numb. I like that. And just so you don’t think I ignore my children, I stop whatever I’m doing no matter what it is and take care of them. They come first, in case there was any question about that. When this timer goes off, I reset my At the Computer timer and get going on computer stuff again. I’m sick. I’ve had a yucky cold for over a week now. Not fun. Which is a dumb thing to say. Have you ever heard someone say, “I’m sick. It’s so much fun!” Yeah, right. So anyway, I’m trying to rest. But I’m also a Mom. So that pretty much means I’m not getting much rest. Don’t you think mom’s should be exempt from getting sick? Because when a mom is sick, nothing stops. Nothing changes. But the mom feels crummy. During the course of a typical sick day, my mind is not really paying attention to when I took my last dose of medicine. How in the world am I supposed to remember when to take the next dose if I can’t remember when I took the last dose? What if you have multiple people sick at the same time? With children especially that’s an all-too-common tale. So set multiple timers. Label them with a sticky note if you have to so you can remember which timer is for which sick person. I babysit two children everyday after I take the older kids to school. One of them is in the process of potty training. If I don’t set my timer, the child inevitably pees her pants and then I get the lovely job of helping her clean it up. Not my favorite chore. No siree! But if I set the timer, a beautiful thing happens called no accidents! At least there haven’t been accidents for a long time. Love it. She wins. I win. It’s just a win-win. I really like win-wins. They’re much better than lose-loses. I don’t know about you, but if I don’t set some kind of alarm for checking the laundry, then it’s almost as if the laundry ceases to exist once I push the start button and walk away. I go about my day oblivious to the fact that my laundry is starting to mold and mildew in my washing machine. Evening comes and I suddenly realize my laundry is still in the washing machine. Now I have to re-wash that load so it doesn’t stink. I start the washer, push start and walk away. Um, get where I’m going with this? I don’t set a timer and go to bed forgetting all about that poor load. I get up the following morning and – blam! – I again remember that pathetic load of laundry has now been washed twice, sat for hours mildewing twice and it still hasn’t made it to the dryer! (I wouldn’t know anything about this, of course.) And the reason I remembered is because there was something in that load of laundry that someone needed. Just set your timer. Please. I’m begging you. It doesn’t matter what kind of timer you use. I have electronic timers with magnets on the back. I use my stove timer. There’s windup timers. I use different apps on my phone as well. There’s a bazillion different kinds of timers and we all have at least one I’m sure. If not, put it on your Christmas list. It’s called Snappy Timer. You can label each timer however you want so there’s no confusion as to what the timer is for when it goes off. And you can set multiple timers at once. Easy to use. If you’ve read my blog for any amount of time, you know that I’m all about timers. Do you think I’m beating a dead horse with the timer issue? I don’t. Because I bet most of you aren’t using your timers on a regular basis. Am I right? I will probably never stop talking about the importance of timers. Go set yours right now! That’s an order. Said very nicely of course. This entry was posted in Organizing and tagged computer, facebook, laundry, paying bills, pinterest, scrapbooking, sick, snappy timer, timer. Bookmark the permalink. 3 Responses to timer – you using yours? Ha, I love the laundry story. I do that all the time…do I set a timer? No! I will now, well once I buy more. I only have 1…don’t be mad! ha ha!